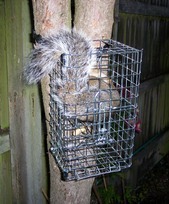 The Procull tree mountable grey squirrel trap is designed and manufactured here in the UK. Tested against the latest humane standards, the Procull was granted ‘Approved’ status by DEFRA in March 2016 for use against grey squirrels in England. Although it may look a bit like a cage trap, the Procull has been developed to deliver a very quick and humane kill.. Grey squirrels are a non-native species making it illegal to release any captured individuals back into the wild. The Procull is the ideal choice for those who are concerned about the humane dispatch of these animals. Self contained in its own integral mesh cage with baffles to guide the squirrel to the strike position for the optimum humane kill. No need to build your own tunnel or worry about correctly orienting the squirrel into the target area. Integral setting lever allows the two powerful killing springs to be engaged AFTER you have baited and set the trap, allowing you to position and adjust the trigger in complete safety. A Pendulum trigger means that the trap is very versatile and can be used inside and outside and mounted horizontally or vertically, either way up on a fence, in a tree or on the ground. Easily camouflaged with local materials such as twigs and leaves entwined in the cage walls or covered with plastic.